The Commuter Student Resource Center (CSRC) aims to celebrate the commitment UIC off-campus students makes to their education. One day each month, CSRC staff will host on-campus events that can include community-building activities and prizes. 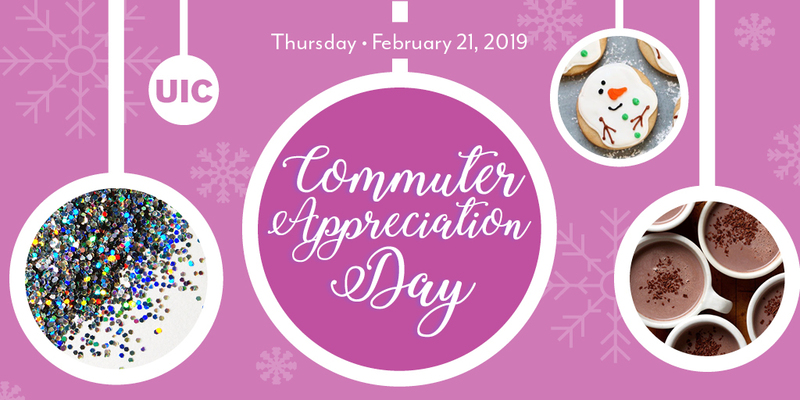 Please see the dates for our upcoming Commuter Appreciation Days below. More details on what you can expect at each Commuter Appreciation Day will be provided here as the date approaches. Get Sweet Treats from Argo Tea! Customize your own hot cocoa. Create your own stress-relieving glitter jar. Decorate a Winter Wonderland themed sweet treat with your friends! Every few weeks, the CSRC team will host a community-building event in the center and around campus. Each event is centered around a specific activity, providing a chance for students to connect and decompress. Please see the dates for our upcoming UIC Connect events below. More details on the activities that will be featured in these programs will be provided here as the dates approach. Love UNO? Compete in rounds of UNO for sweet prizes! It’s that time. Show off your skills at Super Smash Bros. and compete for prizes and bragging rights. Learn how to make a parachute-cord bracelet in the shape of a beautiful shamrock. A great gift for yourself or someone you think could get into the spirit. Are you a fan of TV? So are we! Back by popular demand, join a team and test your TV knowledge for prizes. Learn more about Earth Day and arrange your own succulent plant. You can paint your own pot using acrylic paints as well! While supplies last. Learn more about on-campus organizations at UIC. – On either date, meet in the Commuter Student Resource Center Main Lounge at 11:15AM or 1:00PM. – We will walk students to the Illinois Room and enjoy the event together. Have you seen the Flames play? Join us. At this special 80’s themed basketball game, the first 1,000 guests will receive a limited edition 80’s themed Flames hat. Commuters will meet at the Credit Union 1 Arena lobby (formerly the Pavilion; 525 South Racine Chicago, IL, 60607) at 6:30PM. Look for the Commuter Assistant holding a laminated “Commuter Meet-Up” sign. Tickets are free for UIC students – must present an I-CARD. We are revamping our reward program for spring. New details will be posted in late January.